Flash drive are so popular and handy yet so weak when it comes to security. Anyone can read your valuable data just by pluggin’ in your USB pendrive. So what? Complicated encryption systems? Software you’ll have to install on every PC? Not compatible with Mac? Meet the Kingston DataTraveler Vault with built-in AES 256-bit encryption! For many institutions like the BFSI (banking, financial services and insurance) sector as well as outsourcing companies (BPOs/KPOs), security standards mandatorily need to be followed. Such organizations have to perform a balancing act between providing usability and flexibility versus data integrity and security. Kingston’s DataTraveler Vault is one such device that the flash drive manufacturer hopes to be the answer to flexibility and data integrity issues and is available in several size from 2GB up to 32 Gb. - A 256-bit industry standard hardware encryption that uses the AES standard. - Auto-lockdown and auto format after 10 unsuccessful attempts. - Complex password input system so that passwords cannot be easily guessed. - The drive is waterproof up to 4 feet. - The drive is FIPS 140-2 Level 2 certified by the U.S. government as being tamper-evident. One thing that sets the Kingston DataTraveler Vault apart from the rest of USB drives is the ‘ruggedness’. The Kingston DataTraveler Vault ’s shell is made from aluminium while the rugged BlackBox is made from titanium alloy. This drive is as easy: the first time asks you automatically to enter a secure password. Any further access will open up (as AutoRun) a simple utility (that’s inside the pendrive) and that’s available for Windows and Mac OS X as well! The Kingston DataTraveler Vault provides industry standard security while being extremely easy to use. Price? The Kingston DataTraveler Vault (2 GB model) is now available for US $ 69.71 (and that’s 52% off regular price). Digital Storage problems? Three hard disk solutions from 0.5 to 1.5 TB! Gigabytes biting you from your PCs or Macs? Discovering the (not so-) unique ability to fill every hard disk drive around? Let’s consider three different solutions to the problem, three hard disk drives suited for every environment. Ideal for adding capacity to your system, the stylish Iomega Prestige 1.5 TB drive offers sturdy aluminum construction along with a convenient stand. It’s the easiest way to save photos, music, videos, and more. Plus the Prestige Desktop Hard Drive is powered by an Energy Star qualified adapter for a cleaner environment. The Iomega Prestige 1.5 TB price is now $149.95 (you save 25% on regular price): that’s slightly less than one dollar per Gigabyte! You feel really bored about your internal drive or need to feed your beloved desktop: chances are you’re in need for the WD! WD Caviar Black 1 TB drives combine a high performance electronics architecture with a rock solid mechanical architecture to deliver the perfect storage solution for your fully-loaded PC or maxed out gaming machine. Cool drive operation, no-touch head technology, and leading-edge vibration protection ensure enhanced reliability and sustained data throughput. Grab the WD Caviar Black 1 TB now for US $ 99.99 and save up to 60% off regular price. Fast, elegant, and ultra-portable, the Iomega Prestige 500 GB Portable is an ideal storage solution for mobile professionals, busy students, and anyone else who needs documents and media files to be available at a moment’s notice. For your peace of mind, this drive is designed to be both rugged and flexible so your files stay safe faced with the rough realities of travel. Half-a-gigabyte you’ll carry around easily with you and that’s fast and smart to connect with its single-cable USB 2.0-powered operation. The Iomega Prestige 500 GB Portable goes for a mere US $ 99.99 (saving 33% off list price). A poker of affordable USB portable hard drive: all pockets, all tastes, different shapes! Not all portable hard drives are just the same! A poker of USB portable hard disks. Check these four USB portable hard disk drives, we think it’s a nifty selection of portable solutions that may fit almost every users’ need. Got a MacBook (maybe a MacBook Air or one of the very latest unibody models)? Thou shalt get yourself nothing but the Iomega eGo Helium Portable Hard Drive . Is there anything aroud that matches better your sleek MacBook/Pro? At 12.8 ounces, not only it perfectly matches the aluminum curves of the MacBooks, but also your pocket. Just one USB 2.0 cable and you’re backing up your data with Time Machine, for example. Ruggedness? The built-in DropGuard feature protects the drive when dropped up to 51″ (Toshiba claims it’s 40% above the industry average)! By the way, the Iomega eGo Helium Portable Hard Drive now sells well under US$ 99, check it for yourself. Power-hungry? What about a SimpleTech SimpleDrive SP-U35/500 500 GB USB 2.0 External Hard Drive ? The sleek lines and ultra-low profile styling of this SimpleDrive were designed by Pinifarina, the very same design firm that gives Ferrari sports cars their stylish lines.Don’t let its beauty fool you. SimpleDrive is a high-performance external hard drive ideal for storing and backing up your music, video, photos and more. Go for nothing but an Iomega eGo 250 GB Rugged Portable Hard Drive . The Iomega eGo 250 GB Rugged Portable Hard Drive comes in a camouflage pattern to add a unique look to your digital style. The Drop Guard feature protects your drive even in the toughest travel environments and provides exceptional durability well over the industry average! The Iomega eGo 250 GB Rugged Portable Hard Drive includes a black Iomega Power Grip band that not only looks cool, but also provides desktop stability and extra durability. Plus, the Iomega eGo Rugged Portable Hard Drive requires no external power supply. 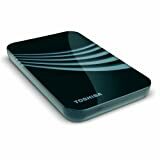 Toshiba 320 GB USB 2.0 Portable External Hard Drive is a cool compromise of performance, features and price. The Toshiba Portable External Hard Drive fits easily within a laptop pouch, a knapsack or even a bookshelf. With a USB cable included, the drive can be plugged into just about any desktop or notebook with a USB port and used at home or at work. Sanho HyperDrive ColorSpace is a color LCD equipped hard drive that allows you to backup, store, view photos/data from memory cards on the go without the need for computers or external power. COLORSPACE comes with Built-in Battery, AC adapter, Car Charger, Carrying Case & USB cable. Furthermore, it orientates images automatically depending on how it’s held, and the included data synchronization functionality enables the drive to sync information with another external HDD or your main rig. Oh, and it can understand 14 different types of memory card, so you’re probably fine on that front. Check it out next month for between $339 (80GB) and $599 (500GB), depending on capacity. 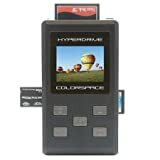 Sanho HyperDrive ColorSpace features a 3.2-inch LCD display, USB 2.0 connectivity, support for S.M.A.R.T., and support for RAW image. It comes with a memory card slots that supports almost all kind of memory cards, including CF Type I/II, MD, SD, SDHC, MMC, MS, MS MagicGate, MS Select, MS PRO, MS PRO MagicGate, xD, xD Type-M/H. Yours for U$ 204.95 !!! Three 1 TB external hard disks: the tough, the cool & the sharing. Three is the perfect number: here comes a triplet of external hard disk units each one with its bunch of (cool) features. 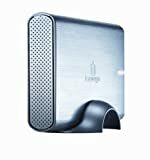 Meet the Iomega Prestige 1 TB USB 2.0 Desktop External Hard Drive 34275 . Sleek, stylish aluminum along with a USB 2.0 and a backup software (licensed) included makes the Iomega the perfect home companion. What about the LaCie Hard Disk 1 TB FireWire 400/USB 2.0/eSATA External Hard Drive, Design by Neil Poulton 301315U ? The personal backup unit perfect for multiple PCs and Macs too. Its triple interface (USB 2.0, Firewire 400 and the latest eSata) ensures a long-term investment and connectivity for all the PCs you still don’t own! Fanless operation and 7200 rpm disk complete the features list. Wanna share your best files? Home sweet (connected and sharing) home. Or small office, by the way. Maxtor STM310004SSA20G-RK Shared Storage II 1 TB 3.5-Inch USB 2.0 Single Drive External Hard Drive may be an answer to the demanding task of sharing the huge amount of files we all deal with. Rugged, tough and built to last the Maxtor relies on a Gigabit Ethernet and twin USB 2.0 (for sharing additional hd or printers). Fire your browser, log in the disk manager and configure sharing access, permissions, folders and a lot of more. Entering 2008? Think about making a backup of 2007-related data! Think about a Maxtor OneTouch 4 500 GB External Hard Drive . This PC- and Mac-friendly drive spins at 7200rpm and features a 16MB buffer. Backup your files with a push of a button or set up the software to perform convenient automatic backups. With 7200 RPM and 16 MB cache buffer, you get fast drive performance, seamless data exchange, and instant access to your files. Simple setup: just connect the USB 2.0 cable, and your Maxtor OneTouch 4 500 GB External Hard Drive automatically appears on your desktop. 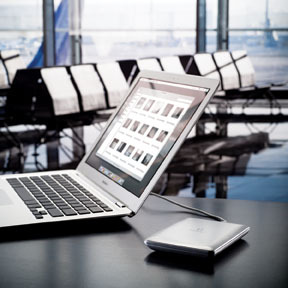 For all those precious pictures, videos, music and data files, external hard drive is a must have. Maxtor OneTouch button - the easy way to make backup copies of your files. Simple Maxtor user-interface for backup scheduling and restoring. Instant storage for your stuff. Auto Updater helps keep your Maxtor OneTouch solution current. You are currently browsing the archives for the External storage category.